Apr '19: Our Trivia Fundraiser for Girls 4 Science was a success! Thank you to all the companies who donated to our raffle! Mar '19: Thanks to everybody who helped out with visit weekend events! We look forward to meeting the new class of chemistry graduate students. 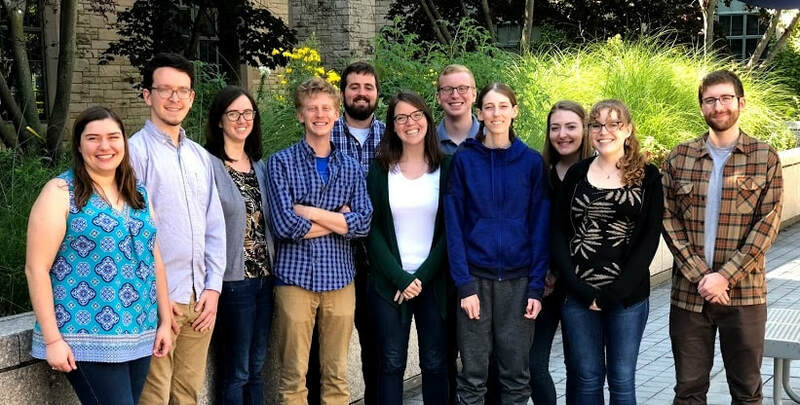 The Alpha Gamma chapter of PLU is determined to promote an enjoyable and broad learning experience for chemistry graduate students at Northwestern University. We enhance each member’s ability to become active in the department and the greater chemical community by providing volunteer opportunities and holding social events and career panels throughout the year. The chapter also sponsors the annual Marple-Schweitzer Lecture, where we recognize graduate-level excellence in research, teaching, and activism through a series of awards. Additionally, we encourage conference travel by offering a series of travel grants. More about PLU activities at Northwestern can be found through the links on the right of the screen. In advance of this year's Industrial Associate's Day, PLU and WISER are hosting a joint workshop on interviewing skills! Enter this year's hiring season prepared. Prof. Patti Wolter from Medill's School of Communication will be leading the workshop. Coffee and bagels will be provided. Going to a conference? Apply for a PLU travel grant! Details can be found here. This year's Marple-Schweitzer Lecture will be given by Prof. Karen Wooley of Texas A&M University. Her talk will be titled, "Natural Product-Based Polymers that Address Health Food-Energy-Water Challenges." Join us for her talk at 4pm and then the reception to follow at 5pm on Tech Patio (Pancoe if rain). We will also be giving out the annual undergraduate and graduate student awards before the talk! Save the date for the first part of our two-part career panel series this summer! Professors from both Northwestern University and elsewhere will be talking about their experiences and how they got to where they are today. And stay tuned for part II later this summer!